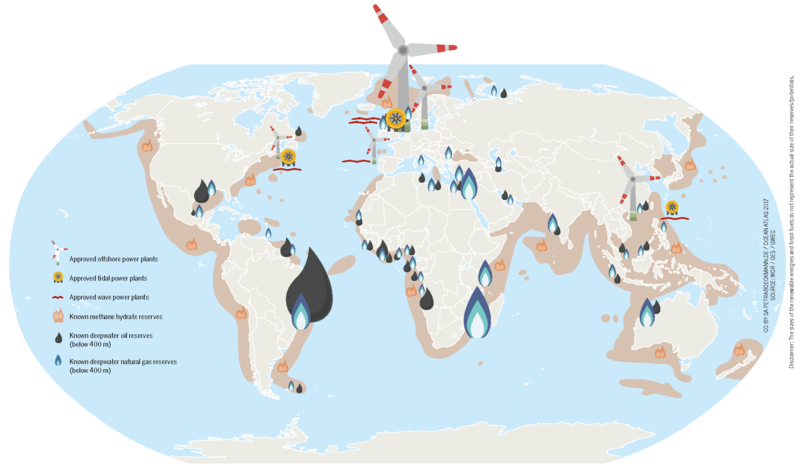 80 percent of global primary energy consumption is currently covered by fossil fuels. Black and brown coal are in first place, ahead of even oil and natural gas. In order to reach the two-degree climate goal, we can only burn 12 percent of the known coal reserves, two-thirds of the known oil reserves, and around 50 percent of the known natural gas reserves. Burning coal is far and away the most climate-damaging way of obtaining energy. Arguments for energy independence lead countries to focus on oil and natural gas. They want to extract them from the depths of the ocean or the Arctic even though doing so is much more expensive than relying on conventional sources like the oil fields of the Middle East. The price of oil is volatile. It is currently low, which reduces the incentive to search for unconventional sources in the ocean. In the years 2011 to 2013 the OPEC countries were still able to obtain prices in excess of 100 USD per barrel of crude oil. In 2016, though, the price sank to a historical low of 30 USD. The reasons were the fracking boom in the United States, the price war policy of the OPEC countries, the reemergence of Iran as an oil exporter, and the weak Chinese economy. Reserves: Offshore gas accounts for 28 percent of global natural gas production. And that figure is growing. The largest quantity of newly discovered fields is located at depths of more than 400 meters. Natural gas is considered to be the most environmentally friendly of the fossil fuels. It thus is seen as an important supplemental energy source for the switch to renewable energy production. Doubts and criticism of its positive contribution to the climate are justified, though, as natural gas (methane) can leak into the atmosphere during extraction and transportation. There it acts as a greenhouse gas, contributing to global warming at a rate 35 times greater than the same amount of CO2 over a span of 100 years. Over a timeframe of 20 years, natural gas is 84 times as damaging as CO2. However, less methane escapes via offshore drilling than via drilling on land because most of the methane released on the ocean floor and into the ocean itself is consumed by bacteria. Reserves: Most oilfields are in deepwater areas at depths below 400 meters or even in ultra-deepwater areas below 1,500 meters. These extreme depths are currently not under consideration due to the low price of oil on the global market. 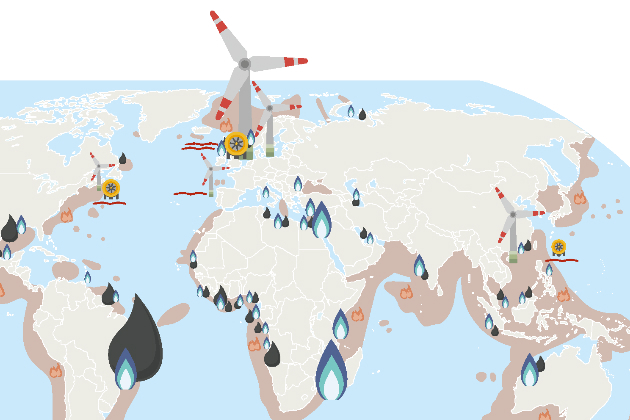 Large oil reserves capable of meeting the growing demand for energy are suspected to exist in the ocean. Offshore oil makes up 37 percent of global oil production. The high pressure at such depths makes blowouts – uncontrolled releases of oil – impossible to control. It took engineers five months to seal the leak in the Macondo oil field after the explosion on the Deepwater Horizon drilling platform in 2010. Reserves: Methane hydrate is located on continental shelves around the world. Especially rich reserves are located near Japan and Alaska, along the Pacific coasts of North and South America, near India and West Africa, and in the Black Sea. Methane hydrate is frozen natural gas locked in crystal structures of water similar to ice; methods for extracting it are currently being studied. It may be possible to fill the resulting cavities with CO2 produced by power plants and industrial plants. However, the process also carries ecological risks, like landslides that would release large quantities of methane into the environment. The advantages and disadvantages of this method of natural gas extraction must be more broadly debated. Technological approaches that seem to postpone an immediate transition away from fossil fuels must be critically evaluated. Locations: In principle, wind power plants can be placed anywhere with strong, constant winds, like on the high seas. However, to be economically and technically feasible the turbines must be securely anchored in depths of 40 meters or less. Numerous offshore plants are hooked up to the grid and profitable. These plants compete with other industries and concerns like shipping, fishing, tourism, and nature preservation for the right to use the seas. There is also much debate (and little research) about how the plants affect sea birds, aquatic mammals, and other sea creatures. The climate-damaging usage of fossil fuels must be reduced to zero over the long term. 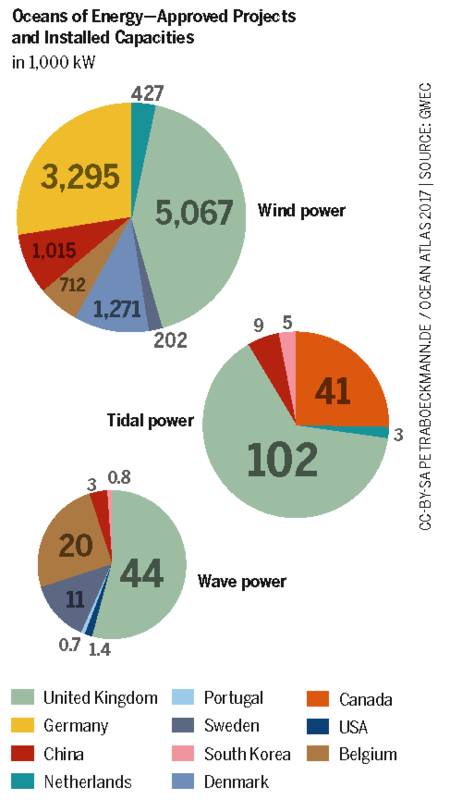 Tidal, current, and wave-based power plants represent another way to generate renewable energy. Unlike wind power plants, they cannot be placed anywhere. Wave height, tidal amplitude, and strength of current must all be considered. Some of these innovative technologies are still in their infancy. The problem is the economic viability of energy production. It is thus uncertain if these technologies will produce a solution. Wind and solar technology already offers a way to address the energy transition in a decentralized way. The plants and animals that currently live in the “wilderness” of the ocean or in marine protected areas are just a fraction of what once thrived in the seas. To understand what we’ve lost and what we might be able to recover, we need to know what used to be.